In summer 1969, the four Gold kids are still young. Varya is only 13, Daniel 11, Klara 9 and Simon just 7. It is the last summer they spend together before the eldest do not want to play with younger ones anymore. But it is also the summer that will change their lives and determine their fates. Having eavesdropped a couple of boys they head to a house where a gipsy woman is telling the future. The kids all just have one question: when will I die? They each get an answer, an exact date. But instead of just laughing and forgetting about it and not taking it seriously, this information will always loom over them. The novel received a lot of attention and was highly acclaimed before being published. What starts as a story about four kids and a strange prediction, turns into one of the best novels of the last years. 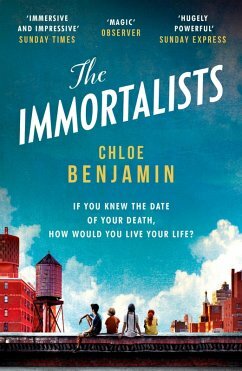 After the opening scene, Chloe Benjamin tells the siblings‘ stories, starting with the youngest who is predicted to die first. Each has a singular life, an interesting character and their story blends perfectly with societal developments of their times. Not only a cleverly constructed plot, but also relevant questions about what is important in life, how much do family bonds count and how free are you in shaping your life -and what is determined by fate? You always wait in a story staring with the presentation of a group of characters for who will turn out to be the most intriguing, the most interesting and the one with the biggest crisis. Benjamin treats the four kids equally. Astonishingly, the moment when each is taking over, he or she becomes really the centre, the focus of everything. Thus, we do not get the development if the others which makes a lot of secrets revealed only later as well as many situations being judged from one perspective when there are actually several points of view which allow you to see a situation also in a completely different way. The story is often sad, full of despair and emotion. It is hard to say how Benjamin makes you completely indulge in it, but you feel with the characters, you can sense their loss and thus get a wonderful novel to read. Exceptional writing paired with a cleverly constructed novel, carefully drawn characters and the smooth insertion of important topics – is there anything more a reader could wish for?